Braintree, MA (August 18, 2016) – Wenham resident Hannah Collins recently completed her summer internship at full-service real estate firm Peabody Properties, Inc. Collins, who hopes to explore the real estate field as a career option, served as intern in the firm’s marketing and resident services departments. The 21-year-old is a rising senior at St. Andrews University in Scotland. 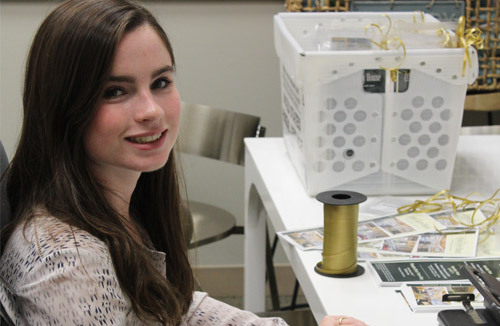 During the course of her internship, Collins played a role in event preparation, creative and graphic design, organizing grant proposals and implementing a letter writing campaign in support of troops serving overseas. She also helped administer the company’s youth and summer resident programs, arranged for a traveling library to visit properties, offered computer literacy tutoring to children and English as a Second Language classes for adults. Based on her hands-on assignments, which included preparing for the opening of Bedford Green Apartments, a supportive housing community for homeless veterans, Collins recognized the benefits of her real-world experience. “I enjoyed seeing how so many people from different departments at Peabody Properties and outside agencies collaborated to open such an amazing property. The skills I’ve learned and experiences I’ve had during my internship have reinforced my interest in pursuing a career in this dynamic, fast-paced industry,” said Collins. According to Susan Gustin, Creative Director for Peabody Properties, Collins was a valuable addition to the Peabody Properties team who contributed her skills to many diverse company projects. “We were thrilled to have Hannah working with us this summer. We value the energy and infectious enthusiasm that our interns bring and we know how important it is for young people like Hannah to gain real-world insights. We are committed to growing our internship program so that students can learn, lead and grow,” said Gustin. Collins will graduate in 2017 with a degree in international relations.